While it’s true that we’ve complained (for years) that there is very little genre diversity in Korean dramas, I think they misinterpreted that to mean that we were sick of traditional romances. I might be alone in this but I feel like we’ve had so many crime, cop, law, bromance, friendship etc etc dramas this year that good ‘ol romance got lost in the shuffle. In comes Black Knight: The Man Who Guards Me, starring Kim Rae Won (Moon Soo Ho) and Shin Se Kyung (Jung Hae Ra). Yeah, it’s another Cinderella story with some supernatural elements but I don’t care. Soo Ho is a successful businessman with a strange ability – everyone who tries to cross him suffers. If his story is to be believed, he acquired his wealth from inventing some medical devices. Now he’s expanding into real estate in Seoul. Hae Ra is a down-on-her-luck travel agent. She lived a cushy, rich kid life till age 14 when her father died and her family lost all their wealth. Now orphaned, she lives with her lecherous aunt. Over a decade ago and shortly after Soo Ho’s father was killed in a fire, he moved in with Hae Ra’s family and fell in love with her. They parted ways some point later but he spent his adult life searching for his lost love. It appears that they promised to reunite at Christmas in a castle in Slovenia so in addition to buying the place, he spends a month each year waiting for her. He sure is an especially patient man because a normal person would have cut their losses and accepted that she’d forgotten their pact. The story begins with Hae Ra’s prosecutor boyfriend being exposed as an unemployed fraud who dates rich women to swindle them. But despite genuinely liking Hae Ra, he can’t date her seriously because she’s too poor. He cautions her to run from any seemingly decent man who expresses an interest in her because there’ll be an ulterior motive. I guess he hasn’t watched the multitude of dramas where such women bag chaebols. She then returns home to learn that she’s getting evicted because her aunt took out her security deposit and spent it on an unlivable, unsaleable house. She attempts suicide and while in a haze, recalls the custom coat she never picked up that her father ordered for her at 14 before their lives took a turn for the worse. She decides that it’s the key to turning her life around and heads over to the tailor to retrieve it. There, she meets a shady lady who still has it and makes a strange deal with her that they trade lives for an improvement in Hae Ra’s. She wakes up from her dream the next day and realizes it was real when she sees the coat. I actually thought that Hae Ra would wake up in the lady’s body because the deal doesn’t really make that much sense. Will she be exchanging lives after she improves Hae Ra’s? Will she improve Hae Ra’s by letting her live the witch’s life? Does she want to make that exchange at a particular moment in Hae Ra’s life? Anyway, her luck starts to change almost immediately. For example, by being the only one to avoid some bad bulgogi, she’s sent on a work trip to Slovenia, her very first trip abroad. I guess it makes sense for a travel agent to have a passport ready. While there, she’s sent on an assignment to meet a photographer. He’s described but she’s not shown a photo (in this day and age?!!?!) and when she meets someone fitting his description, she automatically assumes it’s him, without even checking the name (what da what?). So basically a contrived scenario to get our future lovebirds to meet but I’m not mad. Nope. Not when I’m desperate for a nice romance drama to end the year. He immediately recognizes her, especially having been previously shown a photo by the private investigator he hired to find her. For once, I’d like this childhood love to not live up to the fantasy they’ve built up for years. He seizes the unexpected opportunity, even making her turn off her phone to keep the lie going and that’s how they spend the rest of the day together, with her thinking he’s the married photographer she needs to recruit and him being in awe of her, savoring every moment spent in her presence. I know he was being sneaky but I live for this stuff, okay? And have I mentioned how much I want to watch a romance right now? It’s a pleasant experience for both and they part ways, her with a bell he gifts her and him wishing to see her again. She’s confused when she learns of his deception later that night but the next morning, receives a package containing some of the photos he took of her, a pair of designer gloves (he’d noted that her hands were cold) and a confession. But of course, their story isn’t over and she ends up visiting his castle thereby unintentionally fulfilling her promise and gets locked in after closing hours. To his surprise and pleasure, he finds her asleep on a bench and puts her in bed. After some shenanigans where she walks in on him in the shower the next morning, he feeds her breakfast but she runs away after remembering her scumbag ex’s warning. Hello, dumb girl, I don’t think he’d pamper you like a princess if he were after your organs – he’d just steal them! When she returns to Seoul, she learns that her aunt sold the house to a law firm that will lodge them in a guesthouse till they find a new place. And lo and behold, they’ll be living with Soo Ho. Yay, cohabitation hijinks! It’s true that our lead is stalkerish and a lit overbearing but I’m not that mad at him. It’s a drama and it’s Kim Rae Won so yeah. And I want to know why she made such an impression on him while she can’t even remember him at all. I mean, his name didn’t even ring a bell! There’s some other stuff going on that I’m pretty much ignoring. Like the bad seamstress witch and all her flashbacks. 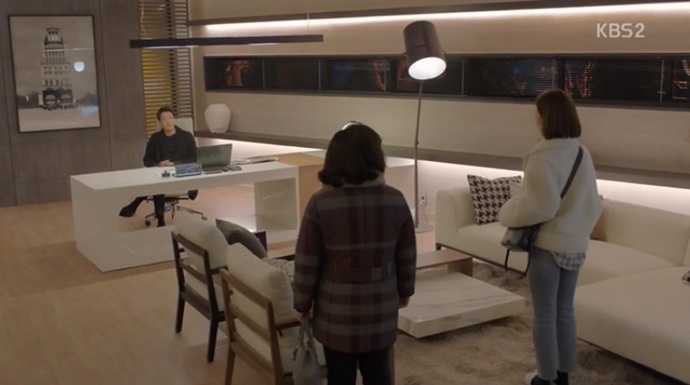 It seems she loved Soo Ho (I’m assuming) and is going to try to keep Hae Ra away from him. Like she was in a love triangle with them in their past lives or maybe doppelgangers. Or something. I’m finding it difficult to care about her character. Then there’s the good witch who might be responsible for Soo Ho’s special luck. She’s atoned for sins and after living over 200 years, has finally become mortal and started to age. There’s also Soo Ho’s dad’s killer who’s the rich father of some guy who loves Hae Ra but is about to get in a marriage of convenience with her frenemy. He might also have something to do with Hae Ra’s family’s fortune reversing. And might also have had a thing for the good witch in his teens. Who knows? We’ll find out soon enough, I guess. As it stands, I’m totally on board with this show solely for the romance – they can keep the rest. I like his cute flirtatious comments and want to see how he wins her over. Not that it should be too difficult once she gets over her ex’s warning because she’s totally attracted to him too. But we all know it won’t be that simple.